Did you know that 1973 came before 1963? In reality that’s not the case but in my world of Avantis it is true that 1973 came before 1963 as I purchased my 1973 Avanti II first and then followed with the purchase of the 1963 Studebaker Avanti R-2. 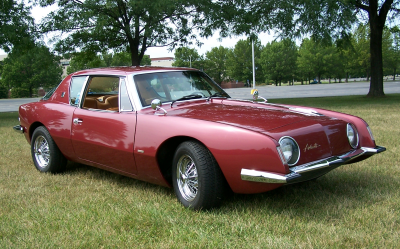 As a junior in college in 1962 I was introduced to the Studebaker Avanti when I spotted one in a dealers showroom. Of course, it was out of my reach and just a dream. It was an absolutely beautiful car I thought, and well ahead of its time. “Wow look at the passenger compartment. It looks like an airplane cockpit.” The designer, Raymond Loewy, planned it that way. A salesman approached me and we started to talk. “Do you know this car has front disc brakes and that’s a first in the US auto industry?” I replied, “WOW, I didn’t know that.” During the rest of the conversation he continued to tell me more and more about the car and I got more and more excited about it. Someday I thought I’ll one. Fast-forward 32 years to the spring of 1995 and life in the Lehigh Valley where I was currently living and a review of a local daily newspaper. I had a bad habit of not only reading the total paper but also reading the classifieds, especially the “Antique Autos” for sale on a daily basis. Lo and behold on that Thursday I saw something that I had never seen in this paper, although I had read it daily for over three years. There it was, an AD for the sale of a 1973 Avanti. I rubbed my eyes and looked again. Yes, it was still there. Well I guess it’s for real, I thought. I made myself a promise, as I set there on my screened in porch that I’d call on Friday if it was still in the paper. Normally I didn’t read the paper until I came home from work but this Friday I picked it up and went quickly to the classifieds. Wow I thought when I saw the car was still listed in the Antique Auto Section. “Well, I’ll call when I get home tonight” I said out loud to my cat Ashley K. Kat. With that it was out the door and to work for the day. Late that afternoon when I returned home I quickly looked at the ad again and determined I would call the listed number. I promptly dialed the number and it just rang and rang. Alas there was no answer. “Ok,” I thought I’d call again tomorrow morning if the ad is in the Saturday edition of the paper. Saturday morning did not come quickly but when it did I grabbed the paper turned directly to the classifieds and there it was the ad for the 1973 AvantiI I. After debating to call or not to call I decided to call. Dialing the number, I thought what if he answers and before I could think further there was “Hello” from the other end of the line. I introduced myself and began a discussion of the car. The first thing the seller told me was that the price listed in the paper was wrong. Yes, I asked, “What was the correct price?” When he told me I said I’d be there in two hours. He gave me directions and said, “OK” and we hung up. I hurriedly got dressed and was out the door. It took me about 45 minutes to get to the sellers house and when I pulled in the driveway, there it was a white 1973 Avanti II sitting on jack stands as he was replacing the disc brake pads. I introduced myself and quickly discovered that the owner had no idea what he had or anything about it. I asked where he found the brake pads and he said that he couldn’t find any so he had gotten Ford Pinto pads as the were the same size and was cutting them down to fit. I just chuckled to myself. Our conversation continued as he asked me such questions as “Did I know the car was built in South Bend IN?” and “Did I know that the car had a Corvette drive train?” I answered that I did. I asked, “How did you get the car?” He said he traded a Panhead Harley-Davidson Motorcycle for it. Interesting I thought. After a few more questions, I asked, “Where are the tires and rims for the car?” He said he had put them on his Buick. I looked and sure enough there they were Magnum 500 Rims and tires on his Buick. I told him I’d give him $500.00 more for the car if he’d put them back on the car. He said, “I guess I can buy tires and rims for that.” and he agreed to do it. With that we agreed on a price and I gave him a deposit as he did not have the Title yet. He said he’d call when the Title came. Wit that I left and laughed and smiled all the way home as I had finally gotten my Avanti. Several weeks later I had a message from the owner and he said he had received the Title from the state and to give him a call. Immediately I called him and we set a time for me to come and get the car. I made arrangements it have a friend go with me so I could drive the car home and when the day came we went for the car. When we arrived the seller asked me “Why didn’t tell him what his car was worth?” I simply said, “You set the price and I was willing to pay it.” He then explained that he had another person look at the car after I did and offered him considerably more money for it. He also said since I had a “Bill of Sale” he would honor it. I thought to myself you have no choice. We completed the transaction and as I was leaving he said be careful as the car seems to be hard to stop. I said “OK” thinking to myself it was the Power Brake booster. I got the car home after a very slow and careful drive as it took both feet pressing on the brake to get it to stop. Yes, the Power Brake Booster was bad. Since owning the car, I have replaced the “Hog Troughs”, re-chromed the bumpers and replaced other items including the carburetor. I enjoy driving the car and taking it to cruises. A 400 CI small block Corvette engine, mated to a Turbo-Hydromantic 400 transmission, powers it. Except for the drive train it is an all Studebaker car. It also has Power Steering and Power Disc Brakes along with Power Windows. The actual manufacturer of this car was the Avanti Motor Corporation which were two former Studebaker dealers in South Bend IN who had purchased the rights and all the remaining inventory from Studebaker in 1964 and started building the car in late 1965. This car RQB 1955 was early enough in the series to have mostly all Studebaker parts minus the drive train, as there were no Studebaker engines available for these cars after 1964 as the foundry was closed when the factory shut down in late 1963. This was a very sad day in automobile history just as was the closing of Bethlehem Steel’s blast furnaces in 1996. Two years after purchasing this Avanti, I was approached by a close friend and asked if I was interested in purchasing another Avanti. The one that he described to me was a completely restored 1963 Studebaker Avanti R-2 located in Florida. It seems like the owner wanted to sell not only this Avanti but also an Avanti R-3 clone along with a Lark Dragster, parts and trailer. After thinking about it for about five minutes, I told my friend I’d like to have the R-2. Wheels were put in motion and before fall arrived I had the R-2 in my possession and in my garage. This is a unique car as it has been totally restored but not in the traditional manner. Examples of this are the fact that it is painted in a 1985 Porsche color known as Winesap. It actually changes colors depending on the amount of sun that strikes the car. It can be red in the shade, maroon in the sun and in between based on the light. In addition the interior was completed in all leather with up graded floor carpeting. The pattern in the seats and door panels is exact to the original Studebaker pattern except it is in leather in lieu of the original vinyl. The serial number of the car, R2372, indicates that the car was built in December of 1962 and had gold Studebaker emblems. Today it retains these gold emblems along with gold Avanti and Studebaker script on the front and rear. The tires and rims have also been changed. Currently the car has 60 series tires matching the original height of the 650X15 tires but they are mounted on all chrome Star Wire Rims with Avanti tagged spinners mounted on the center of the rims. The engine has been upgraded with many changes. Some of these are the installation of R-3 pistons, crank and heads which very simply means the engine has been bored .30 over and currently would be considered a 319 instead of the original 289. It also sports Offenhouser Valve covers and a MSD electronic ignition system. I have replaced the radiator surge tank with a Black original tank removing the chrome one. I have also removed the chromed fan and replaced it with the original orange. Outside of that the car remains as it was purchased. It is an automatic and sports a 3.73 Dana rear end. I thoroughly enjoy driving the car and do so when taking it to a show or a cruise regardless of the distance involved. Even though the car has been extensively modified it remains all Studebaker except for the rims and tires ant the electronic ignition. If the opportunity presents itself, my goal is to purchase at least one other Avanti. What would I buy you ask. I would purchase either a 1963 or 1964 Avanti R-1 or R-2 with a manual 4-speed transmission. With that my collection will be complete, at least from an Avanti point of view, but probably not from a Studebaker one as I would also enjoy having at least one or two pre-war cars and hopefully someday I will. See you in the future as I write about our past.